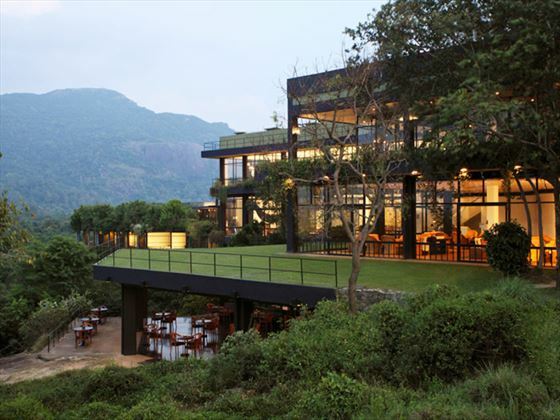 Heritance Kandalama is an architectural masterpiece by Geoffrey Bawa , built overlooking the eighth wonder of the world – the rock fortress of Sigiriya. 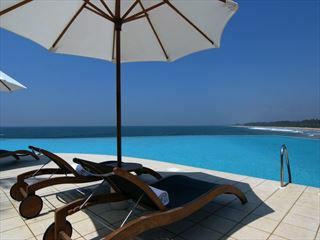 The hotel sits at the heart of the cultural triangle of Sri Lanka, close to five UNESCO World Heritage Sites. The unpaved road through the jungle gives no clue to what to expect – there are no views of the hotel on the horizon. Then suddenly, as you drive up a ramp, a cave-like entrance appears. And even as you step into another world of minimalist white pillars and cool curving corridors, enormous boulders intrude and birdsong hangs in the air. The theme continues throughout the hotel. Heritance Kandalama is shaped like the outspread wings of a bird, following the line of the cliff from which it seems to emerge. The hotel is a staggering 1km from end to end, and rises up seven floors, yet appears to be a perfectly natural extension of the mountainside. The flat roof and timber pillars support a screen of vegetation that attracts local wildlife. The abundance of real-life animals around the hotel is complemented by wonderful large-scale sculptures within it. A metal owl is suspended outside the main restaurant; wooden elephants inhabit the lounge; a stone cobra uncoils along the terrace overlooking the infinity pool. The accommodation at Kandalama embodies the architectural genius of Geoffrey Bawa. Each room is unique. As every room is set at a different angle to its neighbours, even the view from each room is unique. Once you enter your room, feel as if you are alone in the 230 acre Kandalama estate, cocooned in five-star luxury; you are in your own private world. 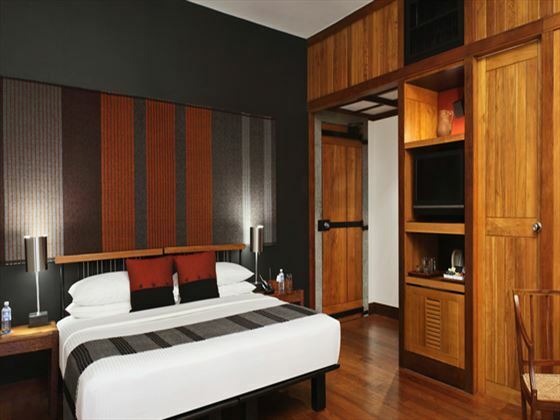 The hotel has 152 Timber paneled and designer decorated rooms, ranging from Superior to the ultra luxury Royal Suite. You have a choice of bathrooms fitted with luxurious rain showers, bathtubs or Jacuzzis. 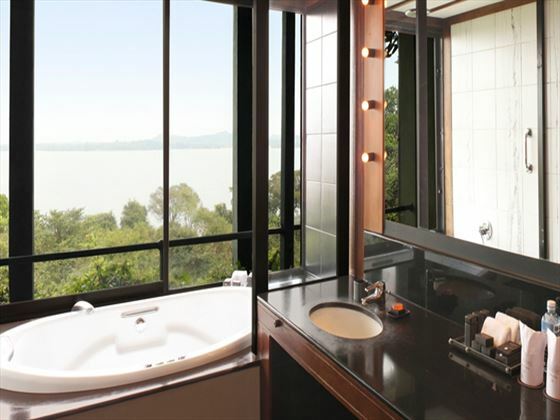 The glass fronted bathrooms make you feel as if you are a part of the picturesque natural landscape outside your windows. Each bathroom is tastefully supplied with a full range of custom made Kandalama toiletries. The rooms are also fully equipped with energy efficient air conditioning, TVs with satellite and local channels, a comprehensive mini bar and coffee and tea making equipment. 2 pools, one of which is a free form pool, looking at Sgiriya in the distance. A lovely Six Senses Spa centre, a bundle of eco and wildlife activities on your doorstep, a variety of games for the children. Baysitting is also available on request. The Heritance Kandalama is the ultimate eco-tourism destination in Sri Lanka. You need not leave the comfort of the Hotel to enjoy the wildlife in the environs. Birds nest in the corridors and outside windows, and accompany you with their soft twittering. Grey Languor’s and monkeys sit on branches within reach and watch you with bold curiosity. Perhaps you will spot the deer family that live in the thicket near the check-in desk, or a herd of Elephants come to quench their thirst at the Kandalama Lake, which is a common sight during the dry season. On offer is a variety of leisure activities from elephant rides to nature tours to our luxurious Six Senses Spa for your indulgence. 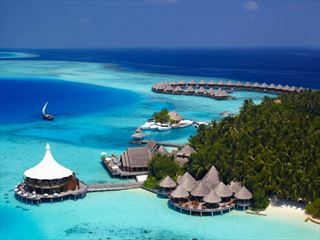 The hotel’s mission is to enable people to experience a unique interaction with nature and culture, while leaving a minimum impact on the environment. 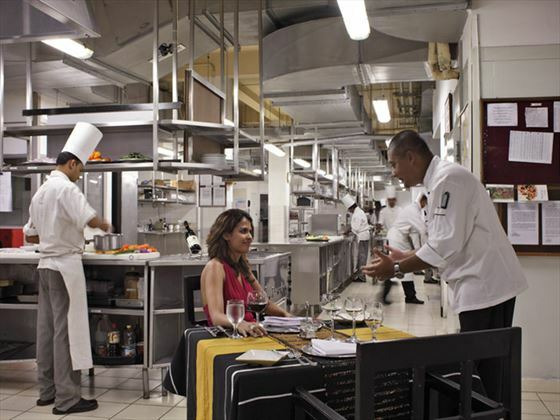 The cuisine at Heritance Kandalama is supervised by its world class Chef who has won numerous medals at the Culinary Olympics and the Culinary World Cup. The state-of-the-art kitchen, complying with international standards in food safety and hygiene, serves out a vast range of scrumptious dishes. 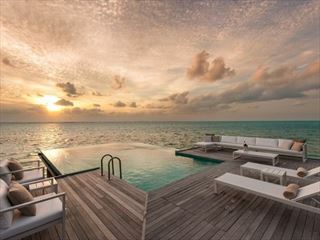 The hotel has three restaurants that can seat a total of 295 people, as well as several outdoor venues including rooftop terraces, where food is served on special occasions. 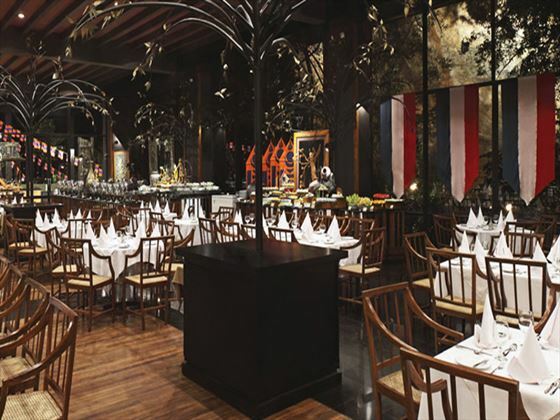 Chinese, Italian, Sri Lankan, Mongolian and barbeque food are offered on theme nights. 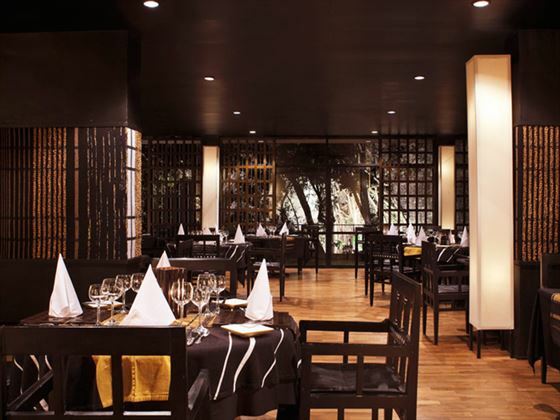 It is some of the best food we have had and the main restaurant is gorgeous.